RJ Balaji has been a part of films like Theeya Velai Seyyanum Kumaru and Vadacurry. The popular RJ plays a very important role in the Vignesh Shivan directorial Naanum Rowdy Dhaan (NRD) with Vijay Sethupathi and Nayanthara as leads. He talks about the film, director Vignesh Shivan, Vijay Sethupathi, Nayanthara and most importantly about the fun video they plan to release soon on their hitchhiking contest. Vignesh Shivan has been my friend for a long while. When he narrated the story of NRD some time back, he was keen that I do a role in it. During those days, I had no idea to act in films. But eventually, I agreed. For the first couple of days into the shoot, I was a little nervous with Vijay Sethupathi and Nayanthara around. 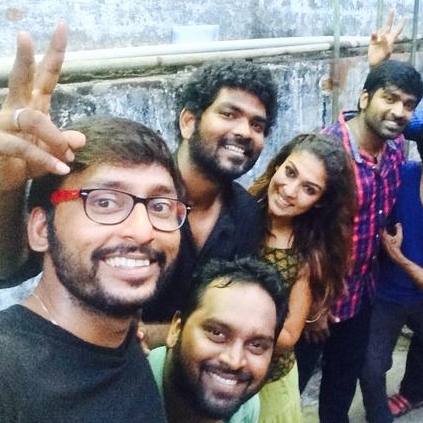 It was not because of Nayanthara but because of Vijay Sethupathi. I had interacted with him from his 'Pizza' days; he had come in my shows and we had a formal and cordial relationship. But when I had to act with him, I was anxious because I know he is a great performer. But slowly after the initial hesitations and apprehensions, after the first schedule, we became friends. As time went by, more than a co-star, I learnt a lot from him which made it much easier to work with him. The same thing happened with Nayanthara too. In the first schedule we did not much talk to each other but as time went by, we all became close. Overall it was fun working for NRD. It is a commercial film that will appeal to all age groups. My presence in the film begins from the opening title card to the end credits. I play a sensible friend who is a part of the hero and heroine’s family in the film. My character will react to situations and will not crack jokes because he is a comedian or he is high on humor quotient. That said, humor will be there in the film but it would be sensible and not forced and out of context. I have done three films till now in this year (Idhu Enna Mayam, Yatchan and Pugazh) and NRD is my 4th film. In all these four films, I don’t play a character that goes and talks about love to someone. Spontaneity is my strength and that’s how I want to be presented as and that’s how you would see me in NRD. Have you danced in NRD? If I answer this, I would be driving all the dance masters who worked for the film crazy (laughs). I have not danced but am there in all the dance sequences. One day, we had a shoot from 6 PM to next morning 1 AM. An important scene was planned to be shot which required me to perform for two minutes which would be followed by Nayanthara and then Vijay Sethupathi. The scene was such that I had to complete my portion first. I began at 7 PM and went on till 1 AM. I kept repeating as Vignesh was keen for better versions. Nayanthara and Vijay Sethupathi were patient, understanding and kept giving me tips to improvise. Finally I completed and of course, they finished their part in one hour!!! It was a memorable experience for me. More than me not getting it right, I was worried for them as I had to make them wait. Once, Vijay Sethupathi, Nayanthara and I were travelling on a National Highway to the shooting spot, when our car conked and that’s when we three had a ‘hitchhiking’ contest. We had videographed this. What happened in this ‘contest’ and who was the winner will be known when we will be releasing the video of it soon. We finally managed to reach the place though! I learnt to act spontaneously without inhibitions in NRD. I am not a spontaneous actor though my comments would be spontaneous. This was a great learning experience for me as regards NRD and Vijay Sethupathi and Vignesh Shivan helped me a lot in this. Nayanthara is perfect. If a role demands certain things, she would deliver it to the point. There would not be one notch lower or higher than this spot. And secondly, every time, she would do the same thing. There would be consistency in her performance. I can’t do that, and I will keep giving different reactions. Director Vijay used to point this out to me in Idhu Enna Mayam which I understood when I was shooting with Nayanthara. If she had to enact 30 times, her reactions will be the same in all the thirty times including the minor finger movements. This was something new to me. People who are in the industry may feel this as a normal feature but to me, it was a big learning curve. Can Kuttram Kadithal churn out more magic for us? People looking for online information on Naanum Rowdy Dhaan, Nayanthara, NRD, RJ Balaji, Vignesh shivan, Vijay Sethupathi will find this news story useful.